Canadian Poncho Homepage -> Canadian Poncho -> The Lounge -> I got something and I think it's pretty nice. TOPIC: I got something and I think it's pretty nice. I got something and I think it's pretty nice. 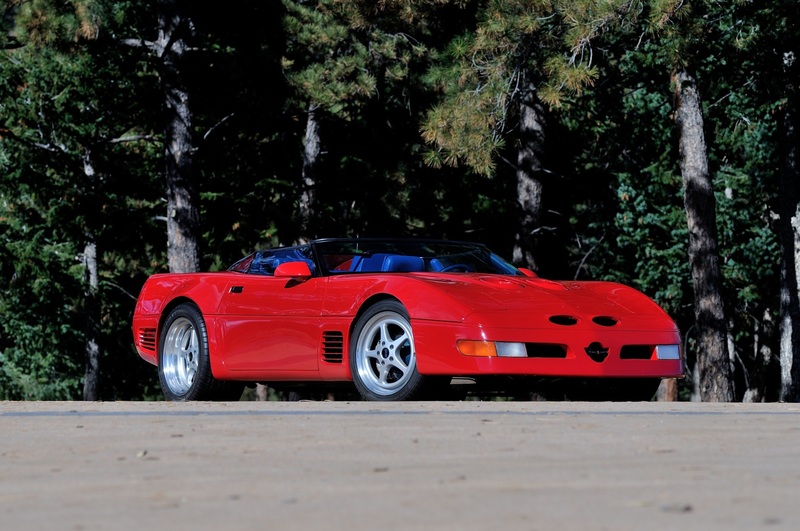 A C4 Corvette Convertible with the LT1. 40th year, 1993. Looks good on you Ray...be a great car for you! Enjoy your new ride!! Very nice Ray...will make a fun cottage shuttle! You better be careful Ray, that little LT1 might give that big block a hard time... I know the LT1's are already old school technology but they're a lot of fun! Congrats. I was almost gonna buy a 2002 Z06 but couldnt fit! The green is perfect on that car. I've always liked the dark greens and it's a refreshing variation on a Corvette (as much as I love them in red, yellow, black or white)! Re the LT1, a shop we deliver to has a mid 90's Firebird sitting there, with no engine. Been sitting there for over 3 years. Apparently a customer brought it in for some engine work, one of their techs pulled the LT1 engine and started engine disassembly, then they let him go. Apparently some of the small engine parts were in his tool box, and they can't seem to find replacements. So the car has been sitting there for over 3 years. I'm not sure what engine parts they're missing, but they can't be that hard to find. That really doesn't make sense because those engines are very common. It's very easy to find everything for them. Very Nice Ray. My favorite version and color in a C4 Vette. Congratulations. Nice car ! Colour combo is perfect. Thanks gentlemen for all the kudos. Its a bit unruly around here now with 6 fully licensed and roadworthy cars to jockey around so that is an area for some work. Nonetheless I really like this Corvette, it was a bit of an impulse purchase, I was really looking to get a twin turbo Cadillac XTS right after Christmas but somehow that turned into looking at convertible Camaro SS then in February I found this Corvette and immediately liked it because of the Polo Green and beige combo plus my all time favourite option the Luggage Carrier! Its not really that optioned out, build sheets shows 35 RPO codes, but convertibles were quite costly back in '93 to start with. It began life in Arizona, moved to Ohio then to Mississauga in 2006, last licensed in 2012. Only one Canadian owner. Its got Air Conditioning a nice add on and a decent LT1 and 4 speed automatic 700R4. The factory wheels are long gone but I do like the aftermarket ones that are on it, the correct option still is on the car is the offset wheels and tires 255/45/ZR17 on 17x8.5 front and 285/40/ZR17 on 17x 9.5 rear. The car was a stock order so no one other than a dealer rep was ticking boxes. Looks like 21,141 built in '93 with 5,712 Convertibles, 818 all colours with beige roof. I do plan to drive it in place of my Cadillac all summer once I get over the jitters of new ownership. I'll save the comparisons to my Northstars and Big Block for another thread. Ray, she looks like a real clean machine. Hope you enjoy your ride but look out for speeding tickets. Cheers. Ray, I not so sure you fit the profile of an average vet owner. 1) short...no 2) bald...no 3)small ?????....? Yes Ted, I'm 6 '1", still have all my hair and they don't call me Big Ray for nothing. Last night I had one of my hockey proteges as a passenger. 6'4" 225 lbs, amazingly we both fit with plenty of leg room. I checked the typical Corvette driver demographics on line and lo and behold age 61 is the median age. I'm not sure any 61 year old can be classified as mid life, even though this is the top reason cited for Corvette ownership - Mid Life Crisis. Congrats on the new car Ray!! I'm a big Clamshell hood Corvette fan. It looks very nice, hopefully it will serve you well. Remember, those LT1's are reverse cooling, rad cap is on the bottom. It looks like a score for Ray! Hopefully I get to see it in person this cruising season. The wheels almost appear to be the type used on the Callaway Corvettes of that era. It is funny you mention the demographics. There was a guy in Ancaster (now deceased) that bought a new '68 Corvette coupe with a 427 435-horse. Normally he drove a Country Squire wagon, but once in the Corvette he seemed to go through a personality change. He still had the car in 2005. Back in '91 I visited the Corvette plant in Bowling Green and watched them rolling down the line at different stations. I saw them in all colours, but my favorite 2 were on the convertibles: Polo Green with tan top & interior, and Quasar Blue with black top & interior. Competition Yellow & Bright Red were also nice; Turquoise metallic was very obscure & trendy for the time. I guess you are right on the wheels Cam.